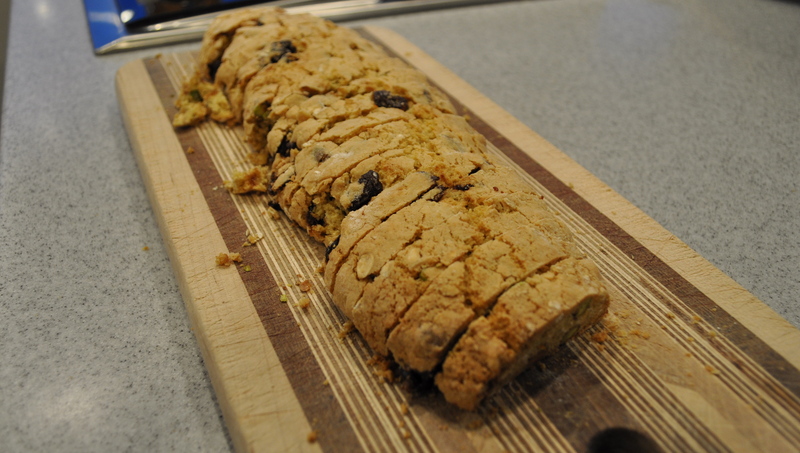 Pistachio and Dried-Cherry Biscotti – Got Nourishment? 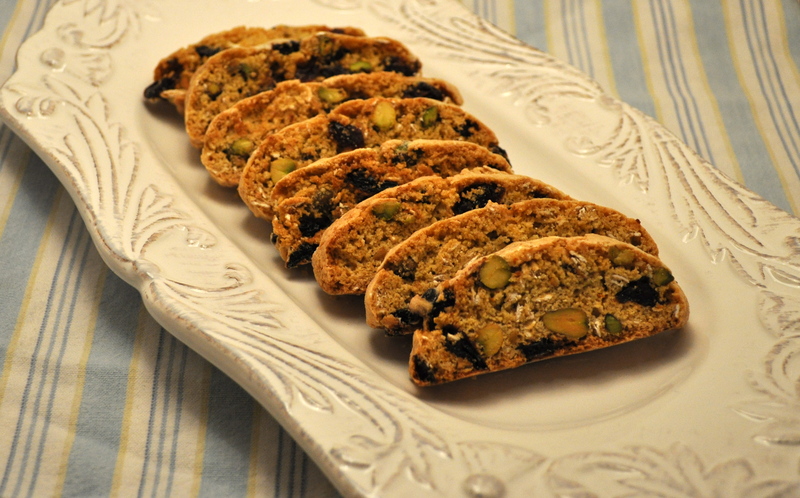 Biscotti are a type of hard Italian cookie. They are hands down one of my favorite cookies. Although they’re not gooey and chewy like I usually bake my cookies, these cookies are a treat to eat! According to On Food and Cooking, the word biscuit means “twice-cooked” in French. Now, biscotti are leavened with baking powder, baked in flat loaves, and then cut into pieces and baked again to dry them out. 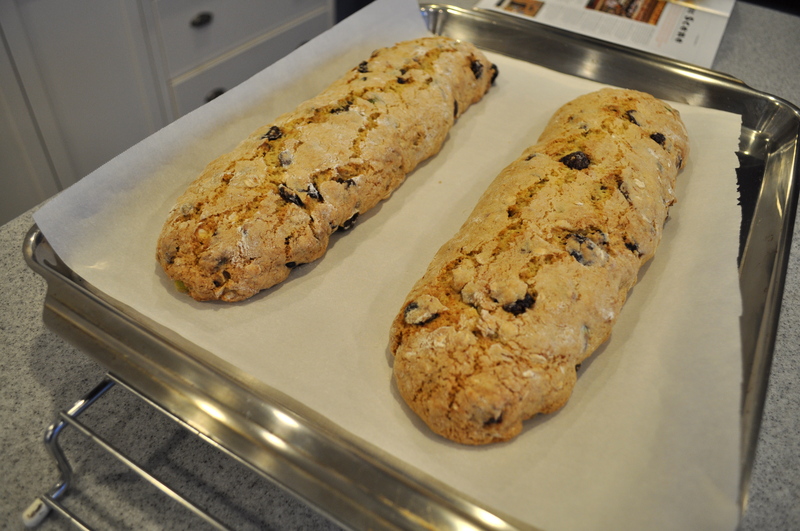 Biscotti are often very low in fat because you do not add much oil or butter. This particular recipe only uses 3 tablespoons of vegetable oil (I used extra light olive oil). The end result is a crunchy, sweet, satisfying treat. You can mix up what you mix into the dough. This recipe calls for dried cherries and pistachios, but feel free to experiment with other dried fruits and different varieties of nuts! They are best enjoyed dipped in coffee, tea, or milk, which softens up the crunchy biscotti. Or for a more traditional Italian way of consuming them, serve with an espresso at the end of a meal. There is another type of biscotti that can be served with Vin Santo (an Italian dessert wine) at the end of a meal. This cookie is called cantuccini or cantucci. Short Italian lesson: Cantuccini are small cookies and cantucci are larger (denoted by the ending of the word). Cantuccini are small almond biscuits and they are dunked in a very small glass of the sweet dessert wine. Yum! Zest! Try not to zest the white pith of the orange or lemon, as it has a bitter flavor. I ended up adding one more egg because my dough was WAY too dry and crumbly. Before cutting with a serrated knife. Don’t worry, they will crumble a bit! Now back into the oven to dry one last time. Preheat oven to 350 degrees Fahrenheit. Line a large rimmed baking sheet with parchment paper. 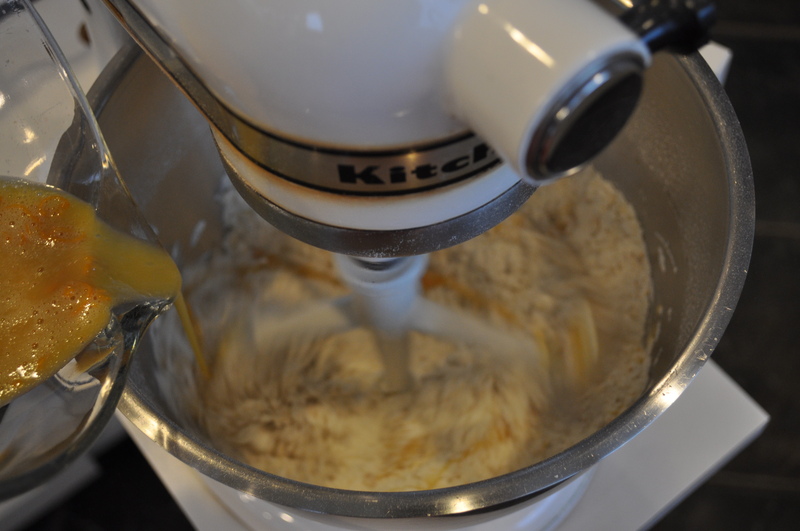 Combine first 6 ingredients in the bowl of a stand mixer fitted with a paddle. Blend on low speed for 30 seconds. Meanwhile, in a separate bowl, whisk together eggs and next 5 ingredients. 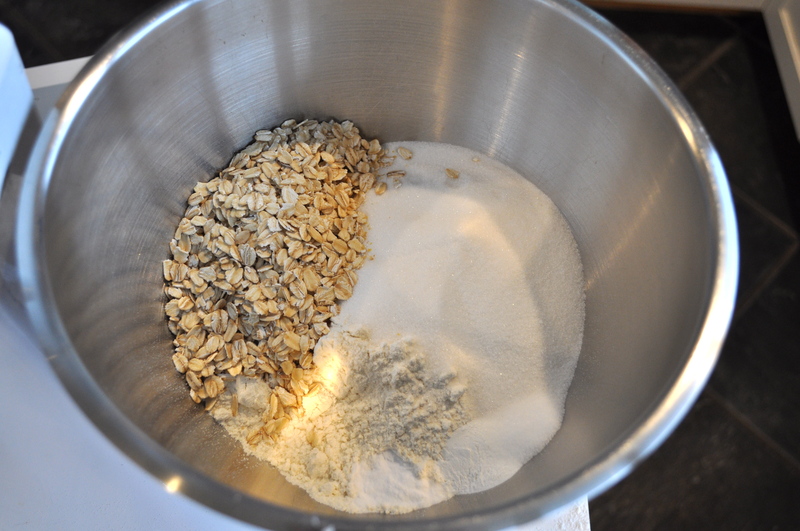 Add egg mixture to flour mixture; beat until combined. Fold in cherries and pistachios. 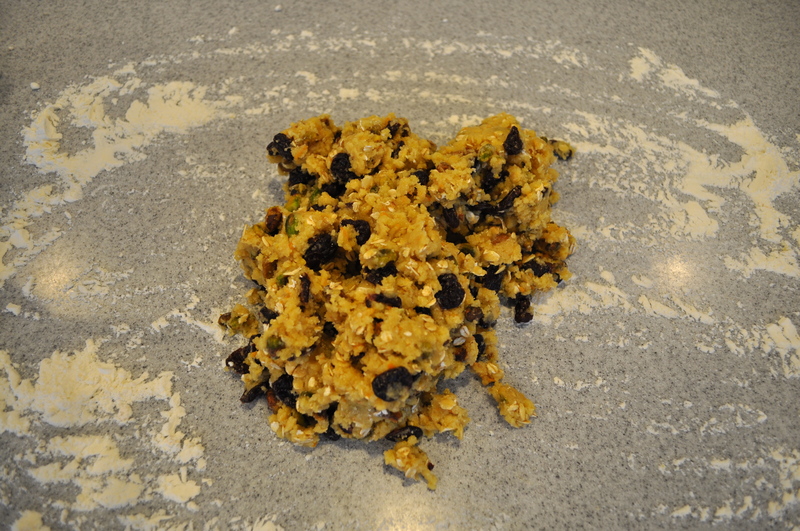 Transfer dough to a lightly floured surface; divide in half. Using floured hands, shape each dough half into a 16″-long log. Brush off excess flour; transfer logs to prepared sheet, spaced 5″ apart. Flatten each log into a 2″-wide strip. Bake, rotating sheet halfway through, until browned and set, about 30 minutes. Transfer to a rack; let cool for 15 minutes. Reduce oven to 250 degrees Fahrenheit and arrange 1 rack in top third of oven and 1 rack in bottom third. Line a second baking sheet with parchment paper. Transfer biscotti to a work surface. 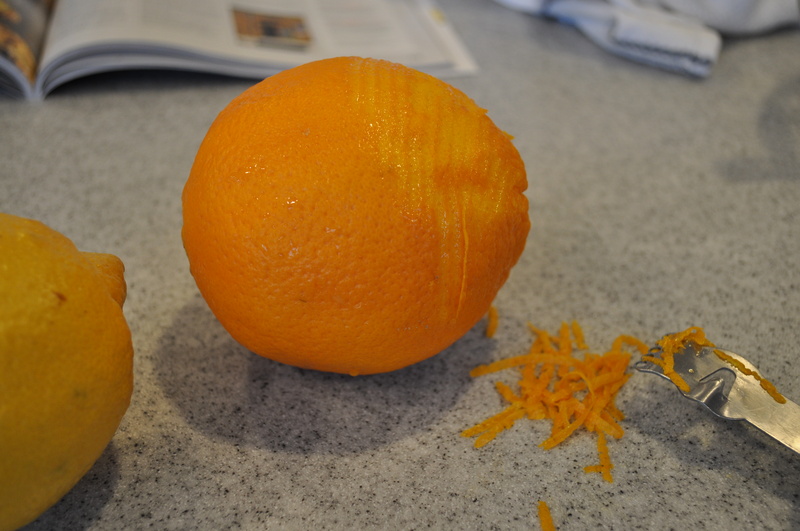 Using a serrated knife, cut each strip diagonally into 1/3″-thick slices. Arrange slices, cut side down, on baking sheets.